For much of American history, Supreme Court nominations attracted little public attention. The rancorous public hearings that characterize contemporary confirmation struggles were unheard of prior to the twentieth century. Today, except for presidential campaigns, no single constitutional event produces more controversy and interest than the nomination of a Supreme Court Justice. The intense scrutiny of this process is not surprising, as the Court addresses profound issues of civil rights and liberties, constitutional law, and economics policy, and the power of one vote is considerable. As it has done so many times before, regarding Bush v. Gore, the Supreme Court in 2000 inserted itself into a critical and ongoing national debate. Slavery, property rights, abortion, individual privacy, freedom of religion—all of the great issues that have confronted the United States have come before the Supreme Court for resolution. Judicial philosophies, plus ideological formation for American conceptions of law, justice, and democracy are rhetorically important. Parry-Giles examines some controversial and ideologically meaningful Supreme Court nominations from 1916 through 1987: Louis D. Brandeis, Charles Evans Hughes, John J. Parker, Thurgood Marshall, Clement F. Haynsworth Jr., G. Harrold Carswell, and Robert Bork. 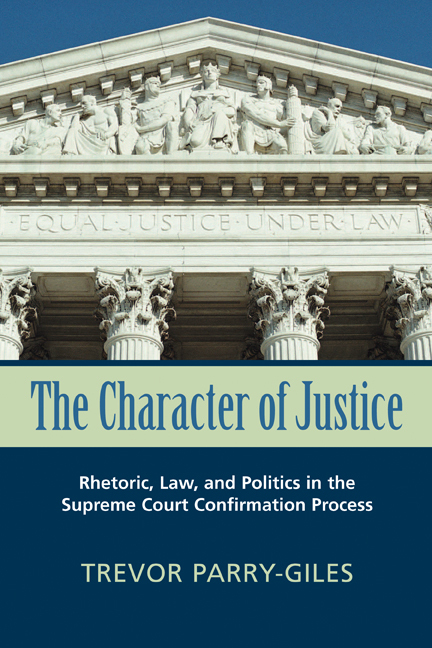 The book also discusses recent confirmations, including Clarence Thomas, Ruth Bader Ginsburg, and Stephen Breyer. The Character of Justice points to the centrality of this process to and the ideological constitution of the American system of democracy and law.